Maxie and Cécile chalking the small animal barn. When Anthony left, Cécile came. she was a darling girl and very sweet natured. She smiled and tried to understand our English and laughed when she couldn't make out what in the world we were talking about. This is the only picture we have of her when she didn't have her oversized earrings on, even in the barn. (We told her they would pick up the barn smell, ruining them for future wearings, but she didn't care....). but a sudden and severe illness put her mother in the hospital back in France. As the oldest of three children Cécile was needed back home immediately. She was nervous when she came to tell us about the call from her father. and sent her on her way. We wondered what we would do for the help we needed. The "FAB FOUR" were soon to arrive! This is the home where my children and I lived for eighteen years in Logan, Utah. It isn't very large and certainly not flashy. You might even say it looks ordinary, almost common. But the things that happened in this home were anything but common. Four of my six children were married from this home. and they all came home to this home. We were living in this home when Grandpa Stevenson passed away. We were living in this home when 18 out of 26 grandchildren were born. 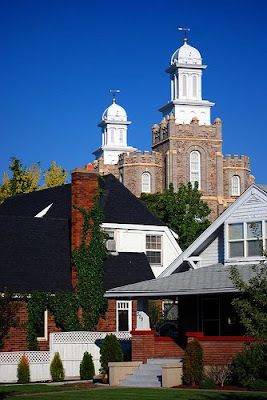 and look out at the temple on the north or over all of Cache Valley on the south. We had numerous pets that lived and died and brought us happiness and comfort in this home. and countless songfests at the baby grand piano in the living room. and basked in the glow of the lights from the Temple. in the large upstairs bedroom. There was only one bathroom and no one ever seemed to mind. a realtor was putting up a "For Sale" sign on the front lawn. We stopped and asked if we could go through it. "This is it Mother...can you feel the wonderful feeling here? we even loved the squeaky, screechy back door. The last time we were in this home was several years ago. and had an encompassing feeling of gratitude for all that had occurred while my children and I lived there. At the same time I had an unexpected but reassuring feeling that it had done all that it needed to do for me and for my posterity. It was not only time to move forward, it was right to move forward. Two years ago this home was sold. I don't live there anymore and neither does my family. and my children and their families live in various parts of the world. and the richness of my life. that are as dear to me as those of the past. we were not able to be there. My brother went into the kitchen to leave a set of keys for the new owner. I would like to think that it always will be.